New book, 88 pages, SS26007. 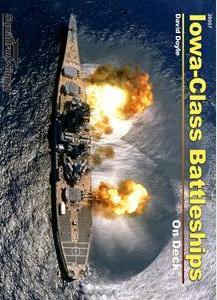 The Iowa-class battleships were America's - and the world’s - last active battleships, serving as recently as 1995. Back in the World War II era, six of the class were ordered, and four completed: Iowa, New Jersey, Missouri and Wisconsin. The Missouri rose to fame as the site of the Japanese surrender ending WWII. Each armed with nine 16-inch rifles able to hurl 2,700-lb shells more than 23 miles, the Iowas were capable of combating formidable sea-going foes. In actuality, however, their huge main guns were used instead, to shell enemy land positions during WWII, Korea, Vietnam, and the Gulf War. In later years their original arrays of 16-inch and five-inch guns were augmented with missiles, including the Harpoon as well as the Tomahawk cruise missiles. Explore the decks and depths of these mighty warships, once home to thousands of sailors, 88 pages packed with over 270 color photos, carefully chosen to show the subtle differences between these four near-identical ships. This item was added to our catalog on Tuesday 23 September, 2014.